Elsinore, or Helsingør, is the only large Danish city that owes its existence exclusively to the sea and not its farmland. It was founded in the 13th century. In the 1420s, the Øresund tax was introduced, which gave the town more muscle power. Krogen Fort (later called Kronborg) and the street grid were built for houses populated by foreign sailors and traders. 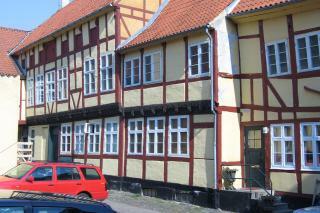 At the beginning of the 17th century, Elsinore was Denmark's second-largest town. But it wasn't all plain sailing. The wars with Sweden in 1658-60 and the plague in 1711 were major setbacks. The Øresund tax was lifted in 1857 but ferry travel, shipyards and tourism helped safeguard Elsinore's prospects after 1880. Elsinore is a treasure trove of old houses. Most of these historic buildings are in the area called Sundtoldkareen between Stengade, Strandgade and Brostræde. Merchants, consuls, vassals, publicans and pharmacists spent the proceeds of the Øresund tax and Kronborg on building beautiful town houses. Take a stroll there and step back in time past stylish medieval, renaissance, baroque and classicistic houses standing side by side. But that's not all. Find an open gate on Stengade, for example, Dommergården 72-74. And you may glimpse a row of long deep gardens and old stone houses. These are the remains of the 16th century plots of land from back when Strandgade had no road but was still just beach.